The purpose of this research was to investigate the relation between cultural capital and the individual’s cultural and intercultural competence in the contemporary information society. 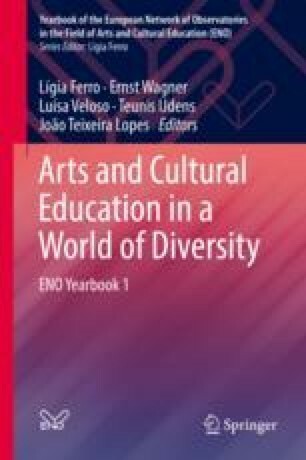 The cultural capital and its accessibility are the most influential factors in the development of cultural competence as a result of arts education. Globalization, integration and social conditions create the necessity to be tolerant, open-minded and helpful, respond flexibly to complex problems and be well prepared for living in a continuously changing environment that has richness of cultural diversity. This article analyses two characterizing aspects of the information society, and the challenges placed upon the education system, specifically teacher education in Latvia created by increasing migration. The authors provide an insight into a study of the experiences of young teachers when working with children who have migrated from other countries. The study concludes by providing a theoretical framework and conclusions based on the research outcomes regarding the challenges related to supporting teacher education in Latvia. Barrett, Martyn, Michael Byram, Ildikó Lázár, Pascale Mompoint-Gaillard, Stavroula Philippou. 2014. Developing intercultural competence through education. Council of Europe Pestalozzi Series 3. Available at: https://www.coe.int/t/dg4/education/pestalozzi/Source/Documentation/Pestalozzi3.pdf. Accessed 21 Jan 2018. Bourdieu, Pierre. 1986. The forms of capital. In Handbook for theory and research for the sociology of education, ed. J.G. Richardson, 241–258. New York: Greenwood Press. Available at: www.brockport.edu/sociology/faculty/Cultural_Capital.pdf. Accessed 21 Nov 2017. European Commission Education. 2009a. Strategic framework for education and training. Available at: http://ec.europa.eu/education/lifelong-learning-policy/framework_en.htm. Accessed 21 Nov 2015. ———. 2009b. Strategic framework for education and training. 2009/C 119/02. Available at: http://eurlex.europa.eu/LexUriServ/LexUriServ.do?uri=OJ:C:2009:119:0002:0010:LV:PDF. Accessed 21 Nov 2015. Margeviča, Ieva. 2015. Jauno pedagogu starpkultūru izglītība Latvijā: diasporas bērnu un jauniešu izglītība. In Radot iespējas attīstībai, ed. Aija Lulle, Evija Kļave, 163–184. Rīga: Latvijas Universitātes akadēmiskais apgāds. Available at: http://www.lu.lv/fileadmin/user_upload/lu_portal/projekti/diaspora/Diasporas_berni_makets.pdf. Accessed 22 Nov 2017. OCMA. 2017. Office of Citizenship and Migration Affairs data on requests for residence permits. http://www.pmlp.gov.lv/lv/sakums/statistika/uzturesanas-atlaujas.html. OECD. 2010. Reviews of Migrant Education. Closing the Gap for Immigrant Students. Policies, practice and performance. Available at: http://www.keepeek.com/Digital-Asset- Management/oecd/education/closing-the-gap-for-immigrant-students_9789264075788. Accessed 31 Mar 2015. Sipitanou, Athina A., and V. Polyxeni Bougioukli. 2014. The role of teachers training in intercultural competence. Available at: http://www.academia.edu/8641637/THE_ROLE_OF_TEACHERS_TRAINING_IN_INTERCULTURAL_COMPETENCE. Accessed 20 June 2015. UNESCO. 2014. Latvijas Nacionālās komisijas darbības stratēģija 2014.–2021. gadam. Rīga, Latvija, p. 10. Available at: http://www.unesco.lv/files/UNESCO_LNK_darbibas_strategija_2014-2021_apstiprinata_77582a2c.pdf. Accessed 10 Nov 2017.